The California Bicycle Coalition is hearing that Governor Jerry Brown is getting pressure from the California Highway Patrol and AAA to veto SB 910, the safe passage bill for bicyclists. 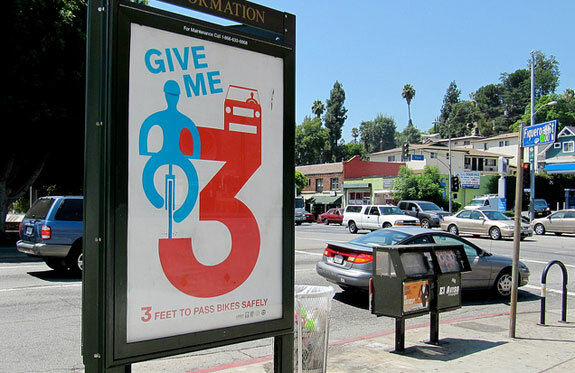 Known as the “Give Me 3” bill, it would require drivers to give people on bikes at least 3 feet of space when passing from behind. It cleared both houses of the Legislature with overwhelming support, and is awaiting the governor’s signature. CHP and AAA are recommending that Gov. Brown veto SB 910, yet neither one has produced any evidence of problems from the 19 other states with these laws, including Wisconsin, which has 38 years’ experience under its 3-foot-passing law. Most CA drivers try give bicyclists enough space, but they get no guidance from CA’s vague and subjective passing law. Many CA drivers also willingly cross the double-yellow line to pass bicyclists on narrow two-lane roads, but why is it reasonable to ask them to break the law in order to do the right thing? More bicyclists die from being hit from behind than from any other type of vehicle collision — it’s the single biggest cause of adult bicyclist deaths. Is this the status quo CHP and AAA want to preserve? The CBC is encouraging Streetsblog readers to email Governor Brown’s office asap and tell him: sign SB 910 into law! You can download a sample letter and get more instructions here. AAA…I hate them. Boycott all AAA related products! I have a better idea… Allow bicyclists to ride facing oncoming traffic. It’s much easier to see what is coming towards you when you’re looking strait at it rather than having to constantly look to see what is coming up behind you. Why is CHP against this? No offense, but this is a terrible idea. If you are operating a bike on the road you follow the street signs/lanes/stops. Facing oncoming traffic will put you in a position where following the law is impossible, as well as unsafe when approaching an intersection. Agree with Diego! Riding in the opposite direction of car travel is old school bike riding and is dangerous. It’s a simple law of physics. Like most cyclist that ride on the street, I have a rear view mirror on my bike so I can see automobiles that are approaching from behind.